The Olu of Warri, Ogiame Atuwase II has defiled the order of Kingship; announcing the abolition of some of the ancient Itshekiri cultural practices. 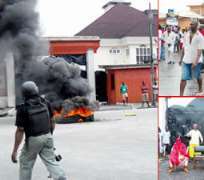 This has led to a serious protest by angry indigenes, in Warri, Delta State who took to the street on Sunday to protest but for the quick intervention of Governor Uduaghan, it would have resulted into total mayhem. The Olu of Warri, who suddenly turned born again by accepting the teachings of Christ, with a Four Square worship center he built in his Palace, made the announcement on the 4th of September 2013. In a document titled "The new order of Iwere Kingdom" the Oba stated that, the "Ogiame" title which had been in existence for over 500 years would no longer exist because it is purportedly associated to a river goddess. He now only wants to serve one God. In the document, The Olu of Warri said, "I also repent from the name and title of “Ogiame” that my ancestors and I have borne, as it connotes our allegiance to Umalokun (goddess of the river) and other deities of the sea, all of which are false gods. The king also dissociated himself from the old time traditional practices which he described as paganism. There are indications that the Oba took this laws without consulting with the elders of the land and has been asked to retract his statement or vacate the throne but the Oba has stated that there's no going back on his decision. About 5000 women have been reported to embark on a protest in Warri today against the Oba's new laws. Real Reasons Tonto Dikeh And Mercy Johnson Are At Loggerheads Exposed! Genevieve Nnaji Set To Wed Mathew Mensah?